To discuss the work of Charchoune from 1945 onwards only is to leave out essential landmarks that, from an early age, showed him to possess a very personal plastic language which never permitted him to be ‘devoured’ by the avant-garde currents at the centre of which he was always present: “My Slav nature with its insatiable curiosity determined that I literally throw myself at the most advanced art, the most advanced poetry and ideas, at everything which is the latest thing” (interview with Pierre Brisset in Le Petit Bonhomme, in March 1987 during the Tribute at the Musée de Pontoise). Refusing any compromise and never making any concessions, he had already established his identity: solitary, secret and silent, like his painting. A confirmed bachelor, he devoted himself to his art, a true calling which forced him to accept (with indifference, one might almost be inclined to say) miserable conditions endured for many years: “I am passive with great determination,” he admitted with considerable dignity. For 10 years prior to the Second World War, Charchoune lived as ‘an unemployed intellectual’, in maids’ rooms without heating or electricity, painting only small works and often, for lack of money, drawing on pieces of paper. The lack of recognition to which Parisian artistic circles relegated him did not in any way alienate his belief in his calling or his faith in his work. With his Slav nature, he possessed a profoundly rooted taste for freedom. At the age of 15, despite his family’s disapproval, he chose to become a painter although, for many years, this calling vied with that of poetry, in which guise, to use his expression, he wrote as a “literary anarchist”. Charchoune wrote throughout his life, composing as a young man aphorisms or short poems in which the spirit of Dada was already apparent, and later texts, most of which remain to be translated. “I free myself, I get it out of my system by writing. For me literature is a valve,” he confided (he referred to the diary he wrote in Russian, between 1958 and 1969, as ‘La Soupape’ (The Valve). It was therefore perfectly natural that he should apply to the School of Fine Arts at Kazan; he was refused admission, however. ”I drew very badly. I have always hated drawing. Drawing and painting are in my opinion the greatest enemies” (op. cit.). His landscapes of this period were ‘lyrical’ and ‘done from nature’, the generous nature of the banks of the Volga, where he had spent his childhood. His painting was rooted in these surroundings and also impregnated by music, practised within the family circle, a habit for which he retained a feeling of nostalgia. Music permitted the soul to express itself, mirroring nature, fluid like water, without whose presence he was unable to live. “Incapable of creating with premeditation,” he acknowledged owing everything to his ”natural primitivism”. His work was constructed by phases which, by their continuity, have a coherence that reveal to us the rigour of his artistic process. In 1909 he discovered the avant-garde in Moscow. Van Gogh, Gauguin, the Fauves, the cubists and Rimbaud. Called up to do his military service, he however deserted, and in 1912 found himself in Paris, where he worked at the cubist Académie La Palette with Metzinger and Le Fauconnier. In 1914 Charchoune travelled to Barcelona, where he discovered pre-Dadaism and the review 391 that had recently been launched by Picabia. He also developed a passion for azulejos, the Mozarabic art form which influenced him in the creation of his concept of ‘ornamental cubism’. In 1919 he was once again in Montparnasse, where he joined the Dada movement and met Picabia through Tristan Tzara. In Germany (he visited Berlin in 1922) he became interested in the experiments then being conducted by Schwitters. During this period he wrote a number of articles for reviews. He returned to Paris in 1923. In 1925 he took up Rudolf Steiner’s Anthroposophy, a school of thought which influenced his entire work and personality. Through André Salmon who, in 1929, wrote the catalogue introduction for Charchoune’s exhibition at the Galerie Percier, and to whom, together with Waldemar-George, he said he owed his career as a painter, Charchoune met Jeanne Bucher who, in 1926, showed his work. In 1927 Nadia Léger introduced Charchoune to Ozenfant, whose purism influenced him for a while. Ozenfant wrote a text for Charchoune’s exhibition at the Galerie Aubier. Charchoune gave up purism and began working on various series, in which a Dadaist inspiration was again apparent: Les paysages élastiques and L’impressionnisme ornemental (1929–193l). Charchoune had found his path. A mystical character began to appear in his works, asserting itself during a period of poverty dictated by the great economic crisis (1932–1942). In 1942 he obtained a studio in the Cité Falguière, where he lived until 1960. In 1944 Edwin W. Livengood offered him his first contract and, in 1945, Charchoune began working with the Galerie Raymond Creuze, with which he exhibited for 12 years: in 1944 (from 1946 to 1948 the violin became a new expressive vehicle anticipating the musical series), 1947, 1948 peintures de 1926 à 1931, 1949 cycle marin with the reappearance of colour, 1951 œuvres récentes, 1952 Charchoune, Venise, 1956 Œuvres récentes. In 1954 and 1955 Charchoune was inspired by the writing of Kafka to make his series Métamophoses. Although since 1912 he had been in regular attendance at the Colonne concerts, it was not until after 1956 that music became the sole medium of his work: Bach, Mozart, Beethoven and Tchaikovski provided him with his “fuel”. Intentionally, he gradually erased from his palette the earlier explosions of colour, favouring shades of ochre, often austere monochromes and shades of white, from which emerged curves, signs and furrows, whose undulation from left to right recalled his relationship with water and music. He achieved a sobriety, where expressiveness and spirituality appear from the rich sensual texture. “Music gives me the subject. Listening to music, I can see the painting with my eyes closed, like a coloured thread unwinding, I see it first with primary colours and my painting starts out as very colourful. I listen and make telepathic marks on the canvas. It becomes ornamental. I begin to spit colour and it becomes decorative, very colourful” (interview with Michel Ragon, Jardin des Arts, September 1966). His impatient desire to express is feelings on canvas while listening to music led him to structure his composition with a sophisticated arrangement of brush strokes that achieve a synthesis in this series of works. In no way abstract, they have generous areas of pure painting, simultaneously luminous and sonorous. This is painting to enjoy and reflect on, but it has always had a limited success with the public, although his colleagues expressed their admiration. Jacques Villon: “I am delighted that I will soon be sharing your elegant sober work”(1941), Nicolas de Staël, who every day contemplated the small painting which hung in his bedroom, Hosiasson: “What can one say about Charchoune who seeks the inexpressible…? Colour – when he uses it – is emptied of all resonance: his painting is inspired by murmurs… Whoever has glimpsed it will be unable to forget it” (1957), and Picasso: “For me, there are two artists: Juan Gris and Charchoune”. Nonetheless it is the adjectives “forgotten”, “unrecognised” and “ignored” that are emitted from the pens of the most eminent writers and critics: Philippe Soupault, Alain Jouffroy, Charles Estienne, Gaston Diehl and Pierre Schneider… Nevertheless, the exhibitions continued, even though fame was of little importance to the artist, who stated: “I was and I remain a man of nature, but I was also born a man of Art, and these three elements, forest, river, music, rapidly became for me a pictorial harmony which I attempted to put on paper”(op. cit.). Exhibitions in Paris in 1957, Galerie J.C. de Chaudun (catalogue) and Galerie Dina Vierny. 1958 Galerie Michel Warren, text by Patrick Waldberg. 1960 Galerie Henri Bénézit, Galerie Georges Bongers and Galerie Jacques Péron. Georges Bongers showed his work again from 1966 to 1967. 1970 Galerie Jean-Louis Roque, text by Pierre Brisset, and again in 1971, when he showed watercolours. He illustrated several works of literature. 1974 Galerie de Seine, Charchoune, harmonies blanches 1924–1974. Catalogue, text by Alain Bosquet, documentation by René Guerra. Abroad he exhibited in New York (1960), Germany, Italy, Geneva and Luxembourg. Among the main group exhibitions: 1948 École de Paris, Boulogne-sur-Mer. 1951, Peinture d’aujourd’hui, Palazzo Belle Arti, Turin: France-Italie. 1952 L’École de Paris, Librairie Hachette, Montreal. 1956 Dix ans de peinture française 1945–1955, Musée de Grenoble. 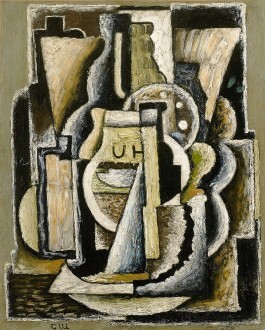 1957, Cinquante ans de peinture abstraite, Galerie R. Creuze; Art abstrait, Musée de Saint-Etienne. 1963 La grande aventure de l’art du XXe siècle, Château des Rohan, Strasbourg. Charchoune participated in the Salon Comparaisons from 1956 to 1961, at the Salon de Mai since 1960 and at the Réalités Nouvelles in 1956 with 7e symphonie de Beethoven, in 1957 with Concerto pour piano de Tchaikovski and from 1958 to 1963. He was given a tribute in 1976. 1980–1981 S. Charchoune peintures 1913 à 1965. Musée de l’Abbaye Sainte-Croix, Les Sables-d’Olonne. Catalogue, Cahiers de l’abbaye no. 39, Henri-Claude Cousseau, Michel Seuphor. 1981 S. Charchoune œuvres 1913–1975, Galerie des Ponchettes, Nice. Catalogue, text by Michel Seuphor. 1988 Charchoune œuvres de 1913 à 1974, Galerie Fanny Guillon Laffaille, Paris. Catalogue, text by Patricia Delettre. Biography, bibliography. 1989 Charchoune, Centre culturel de la Somme and Musée départemental de l’Abbaye de Saint-Riquier. Catalogue by P. Delettre. Museums: Alès – Charleville – Dijon – Grenoble – Les Sables-d’Olonne – Nice – Paris, Musée National d’Art Moderne, Centre Georges Pompidou and Ville de Paris – Pontoise – Reims – Roanne – Saint-Etienne – Strasbourg – Villefranche-sur-Mer – Villeneuve-d’Ascq and abroad. Raymond Creuze: Charchoune, R. Creuze, Paris 1975–1976, 2 vol. Catalogue raisonné of the paintings in preparation by Patricia Delettre.